(WKMG) 4,200 miles — that’s how far this 11-year-old boy is willing to walk to raise awareness for Type 1 diabetes. Noah Barnes is currently on the final leg of his trek across America, from Key West, Fla., all the way to Blaine, Wash.
“It’s going good,” Noah told InsideEdition.com, just three weeks before he is set to finish his goal. From passing through Nashville to checking out the Rocky Mountains, Noah and his parents, younger brother and younger sister have seen it all since taking off on their trip in January. Noah said it all started after he watched a documentary about Canadian hero Terry Fox, who dreamed of running more than 3,000 miles across Canada with a prosthetic leg to raise money and awareness for cancer. But Fox died in 1981, and never completed the so-called “Marathon of Hope.” He was 22 years old. Noah said he recalled asking his mom, “Could I quit being a diabetic?” sometime last year. When his mom told him his condition didn’t work that way, he decided to put his efforts onto raising awareness and looking for a cure. That’s when the then-10-year-old boy told his parents he wanted to recreate Fox’s Marathon of Hope. Barnes told InsideEdition.com he and his wife then decided to sell their home and all their possessions, quit their jobs and cash in their 401k to support Noah in his journey. “Basically everything we own fits in a 10 x 10 storage room,” he said. They took off from the southeasternmost point of the United States on Jan. 1 and are set to complete their journey on the northwesternmost point on Dec. 9. 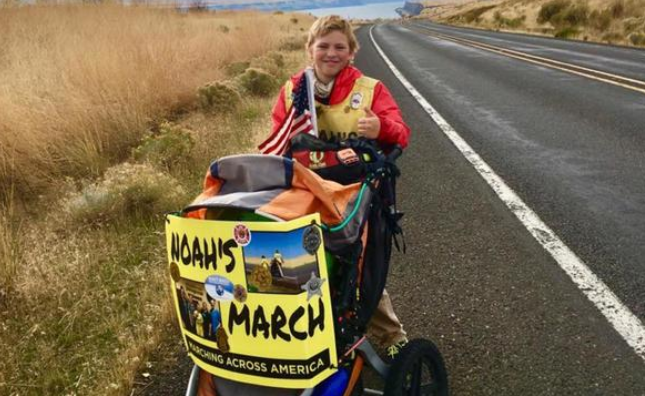 In order to complete the trek, which Barnes said will make Noah the youngest person to walk across the United States, the father-son pair walk an average of 12 miles a day, depending on Noah’s blood sugar levels. His mom, Joanne, provides logistical support from wherever they are staying for the night and Noah’s two younger siblings sometimes opt to join the walk, or they stay behind with their mom. Instead of depending on sponsors to support their trip, Barnes said his family has relied on the kindness of others, including donations from restaurants and staying with host families. To donate to the family’s fundraiser for diabetes research, visit their page.